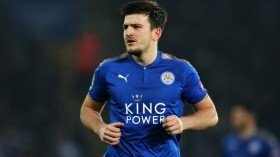 Leicester City manager Claude Puel has indicated that the club have no plans of parting ways with Harry Maguire in the near future amid the speculated interest from Manchester United. The England international was heavily tipped to join the Red Devils during the summer but the deal never materialised with the Mancunian giants being reluctant to match the Foxes' £70m valuation. Thereafter, Maguire committed his future to the former Premier League champions on a fresh five-year deal but this has not ceased the speculation regarding his future. Speaking to reporters, Puel highlighted that he cannot assure Maguire's long-term future with the club but the central defender could stay put for another season at the least. "We cannot have guarantees but I think Harry decided this summer to remain with us and play with us for another season. He is happy with us and saw the quality of the team and its ambition," he is quoted by The Mirror. Maguire has been sidelined for the past five weeks with an injury but he should return to the fray for the weekend Premier League clash against Tottenham Hotspur.